The King has died, and the city of Korvosa is in chaos! Riots, banditry, monsters, and mayhem are turning the normally safe streets of the city into a war zone. Desperate to regain control of her city, Queen Ileosa seeks heroes to aid her in reclaiming control before the largest city in all Varisia consumes itself from within as Curse of the Crimson Throne begins with a bang! 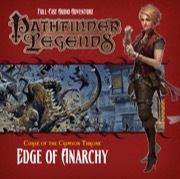 Pathfinder Legends audio adventures adapt the world and characters of the best-selling Pathfinder Roleplaying Game. Each episode runs about 2 hours and features a cast of professional actors, sound effects, and music that immerse you into the dangerous and exciting world of Pathfinder! 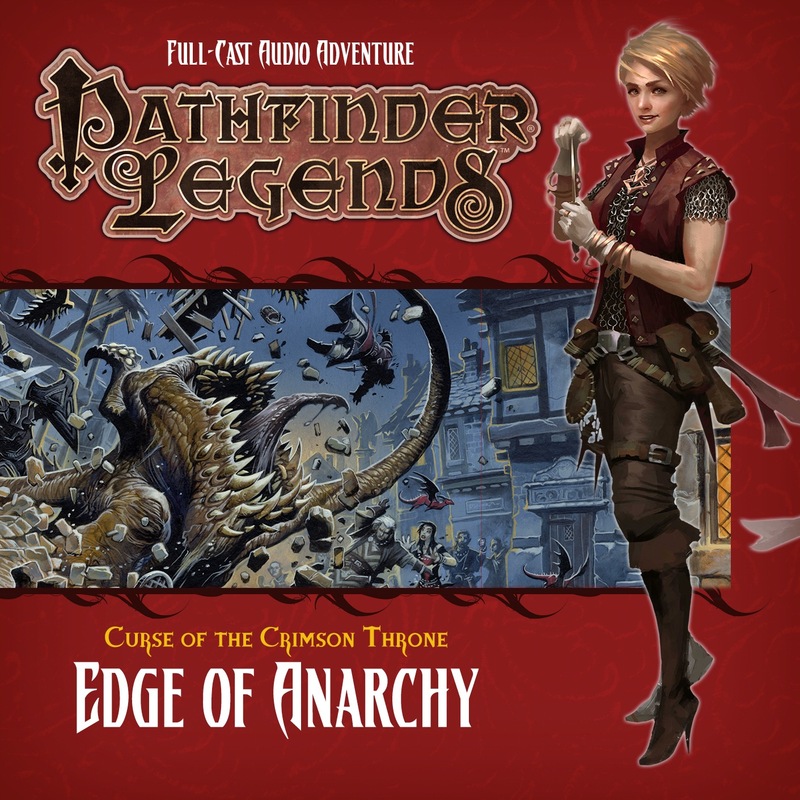 I have consistently enjoyed the Legends series of audio dramas and Edge of Anarchy is no exception. The production is top-notch, and the familiar voices of the iconics continue to invoke the adventure in my mind with their characterizations. I might have wished for some shorter musical interludes (such at on Disc 1, Track 1), and I echo the other reviewer that it does feel like the story was abbreviated somewhat. The length clocks in at about 2 hours, but it feels like a notable chunk of that is solely music. Not that I don't like the music - but, again, there are a lot of places where it goes on for what feels like minutes or so. I also had some issues with the Queen, but not from overacting - but simply from her vocalizations. Her voice reminded me of an older, middle-aged woman - not the young lady who manipulated a king to marry him and gain a throne. I'm willing to chalk that up to personal preference, however. On the whole, however, even my nitpicks can't stop me from enjoying the story. Looking forward already to the next one! Much conversation, very little action. It´s much clearer to the listener what happens in the fight scenes opposed to Rise of the Runelords. The voice actors work well together. Too much overacting, especially from the Queen. Too much loud background music. The lenght is 110 minutes (two music tracks included) but could have been 150 minutes for the price of $22. With 2 CDs you would think that there are more story elements from the AP included, but the opposite is the case: There is much less story included but endless talking between the 4 Iconics and NPCs. There are three fight scenes only! The trailer for this is actually better than the CD itself, because you can understand the Harrow reading. On the CD it´s fast forwarded and with added sound effects that make it hard to understand. I have bought all six Rise of the Runelords CDs and like them, the only things i don´t like about them: you can´t always identify what happenes in the fight scenes (the lack of a narrator is a mistake imo) and that a lot of story elements had to be cut to fit on one CD. I don´t like the "Mummy´s Mask" AP, so i didn´t buy those CDs. Now that i have heard the first double CD of CotCT, i have to say that i like the RotR CDs MUCH better! Not only are they more entertaining, but there is more crammed into them than into this. Maybe i´ll give the second CD a try, but if it is as boring as this one i won´t follow the line anymore. Cool. Now I have only one question, which version are they using? What a great idea to have CotCT as the next audio adventure! While i didn´t yet listen to Mummy´s Mask, the trailer sounds a lot better than the Rise of the Runelords audio plays (they were good but not great), especially the Harrow reading idea is cool. Is this going to be based on the original 6-instalment version or the updated hardcover version? It's going to be based off of the updated hardcover version. So which Iconics are being used for this? The same four that have been featured in the past two series: Ezren, Harsk, Merisiel, and Valeros. The trailer does mention a "Kyra", but that's probably just a coincidence. Glad I spotted the pre-order tab - I've been hoping for a third story, but couldn't work out how to find out for sure. CotCT has a great storyline running through the 6 parts (and presumably the hardback) so with any luck this should be up to the standard of the first two. Roll on 2017! I always thought it was pronounced Keer-rah. Big Finish have Kyra on the cast list for Seven Days to the Grave. So fingers crossed. Sounds like Merisiel is looking for Kyra. Perhaps the Lost Love background trait from the AP? I hate that this comes out after my first session. Like a week late. Do we know the release date of the subscription of this? Or is it the Late Jan street date? Any idea when this will hit audible? That is by far the best production for Pathfinder Legends. I finished my 2nd listening and it is compelling as it is astonishing. Awesome. When is this due to be released? I see there's already a product review entry, but I have a digital subscription and am unable to download it. That's definitely a glitch - I'd email customer.service@paizo.com or start a thread in the CS forum. My CD has arrived, plus I've had access to the download for a while. Steve - I believe subscribers who get the CD also get the download version earlier than the download-only subscribers. That said - I had expected the download earlier than today - which is when it appeared. The download was also available directly from Big Finish at the latest by last Thursday. Perhaps download-only subscribers get it later than regular subscribers. I don't necessarily mind - but I would like to know so I'm not expecting it before it's actually released. In any case - it's released today, and I've downloaded it. I've enjoyed all of the others, so I can't wait to listen to this one! The fulfillment processes on digital-only and physical+digital subscriptions are relatively independent from one another, so one won't necessarily always be processed before the other. Vic - I appreciate the response. I think what I'm asking for is a more precise release timeframe other than "January" - which, typically means sometime between mid-month and month-end. But that's more of an irritation than a gamestopper for me. Are there any plans for this AP to release on Audible?